• High test current up to 80mA yielding resolution of 0.001© on 2© range. • Advanced Filtering method ( based on FFT Fast Fourier Transform) reduces noise interference for obtaining stable measurements. • Automatic and Manual selection of the Test Current Frequency in four bands ( 94/ 105/ 111/ 128Hz) . In Automatic mode, KEW 4106 will select the most suitable Frequency. 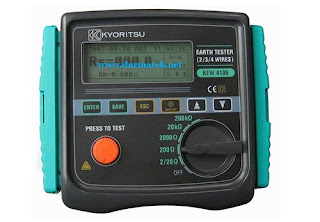 • Several sub-results can be shown on the display: Resistance of the Auxiliary Earth Spikes, Frequency of Test Current, Voltage and Frequency of Interference ( noise) , Residual Resistance Rk, etc. • The stored results can be transferred to a PC using the " KEW Report " software and a USB adaptor ( Model 8212-USB) which are included. between E-S(P) and between E-H(C) terminals AC280V / 10 sec. ( * 3) This instrument is NOT designed to measure line voltages on commercial powers.